Cold-hardy citrus fruit is the most well-suited choice for Georgia as freezes occur in this coastal state. Lemon trees are particularly adaptable to the southernmost region. Identify lemon trees that satisfy desired fruit production while thriving in Georgia's climate. Familiarize yourself with proper care as well as issues that may arise when growing lemon trees in Georgia for vigorous additions to your home garden. The Meyer lemon tree is the wisest choice for Georgia, according to the University of Georgia Cooperative Extension. A very cold-hardy tree, Meyer lemon trees produce good crops for the home garden. The lemon fruit is large, juicy, prized for its sweetness and generally lacks seeds. This tree is hardy to approximately 25 degrees Fahrenheit. The Meyer lemon tree (Citrus x Meyeri) is well-suited for use in a container, making it a versatile addition to the home landscape. Trees usually bear abundant amounts of fruit during the end of winter and beginning of spring, according to the Oregon State University Extension. The Meyer lemon tree displays aromatic white flowers and deep green leaves with a total tree height of up to 15 feet. Dwarf varieties are maintained near 6 feet. 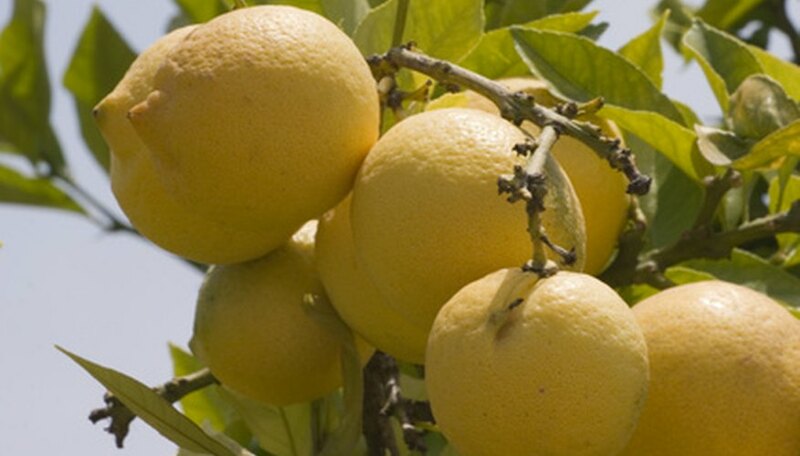 Grow Meyer lemon trees in Georgia in areas that provide full sunlight for eight to 12 hours, according to the Oregon State University Extension. As citrus trees perform poorly in waterlogged soil and may suffer injury, plant in well-drained conditions. Water regularly allowing the top 2 inches of soil to dry out before reapplying water (See Reference 2). For freshly planted trees, begin applying fertilizer in the spring season when growth starts; a complete fertilizer like a 10-10-10 is appropriate, according to the University of Georgia Cooperative Extension. However, from August 1 to February 15, do not fertilize until the tree has reached three years of age. Though Meyer lemon trees are a cold hardy species, trees are still susceptible to freeze damage, particularly if they are young, according to the University of Georgia Cooperative Extension. For protection of young tree trunks, create a 15 inch high soil bank or use a material at least 1/2 foot thick to protect the base of the tree until the beginning of spring. Additionally, when possible, cover trees with a lightweight material cover like a sheet and secure. The sheet does not need to reach the ground but must cover branches. Though lemon trees in Georgia are susceptible to insects and diseases, there is not always a need for panic. Often times, changes are part of a cyclical pattern. If you notice a heavy drop of flowers and fruit in the beginning of spring and again in May and June, this is a common trait of citrus trees. Additionally, trees lose significant amounts of leaves over the course of an entire year, but most heavily in spring, according to the University of Georgia Cooperative Extension. If you are providing appropriate care to your tree, look for problematic symptoms like damage or spotted foliage before becoming concerned.